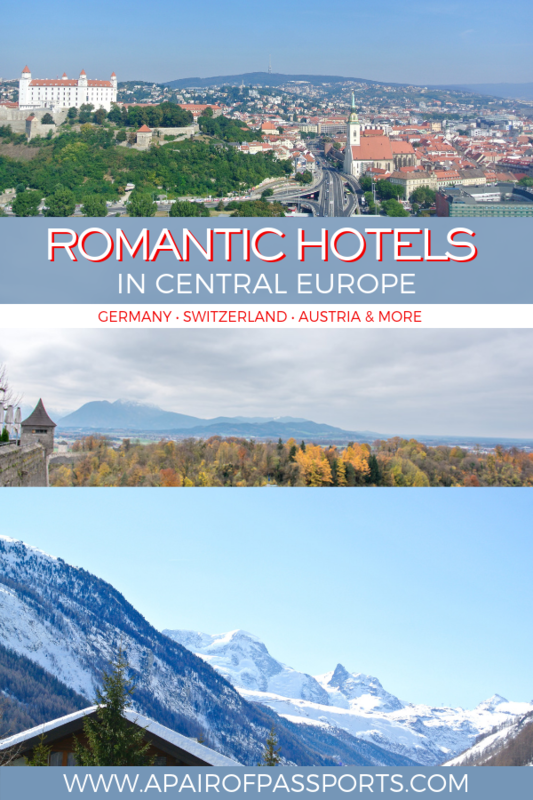 The next installment of our Romantic Hotels series takes us to Central Europe, where some of our favorite countries are located. There’s nothing we love more than a weekend spent aprés skiing in the Alps or exploring castles in Germany. 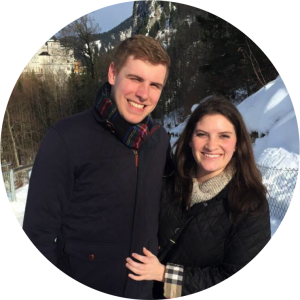 In fact, two of our absolute favorite trips have been Bratislava, Slovakia, and Salzburg, Austria. Central Europe is filled with beautiful scenery, charming old towns, and some truly romantic hotels. In typical A Pair of Passports fashion, though, we stayed in Airbnbs whenever we visited any of these countries. So, we’ve asked other travelers to submit their recommendations for romantic hotels in Central Europe. We’ve also thrown in a few that we haven’t personally stayed in, but are hoping to in the near future. Here’s the list! For the purpose of this post, we are defining Central Europe as: Austria, Czech Republic, Germany, Hungary, Liechtenstein, Poland, Slovakia, and Switzerland. We understand that your interpretation of Central Europe may be different; if you are looking for hotels in France, the Netherlands, Belgium, Luxembourg, Spain, Portugal, or Andorra, check out Romantic Hotels in Western Europe. Alternatively, here’s a list of Romantic Hotels in the UK & Ireland! Tucked away in the Alpbachtal region of northern Austria is the stunningly beautiful Boutique Hotel Schloss Matzen. This one thousand year old castle-turned-hotel is the perfect destination for those looking to experience Austria’s Alps in luxury. The rooms are spacious and maintain the historic feel of the castle with refined yet cozy updates – the setting is almost as if you’ve stepped back in time as a guest in the castle’s quarters! A delicious breakfast buffet awaits guests in the morning, and plenty of unbeatable Tirolean specialty restaurants, such as Sigwart’s Tiroler Weinstuben, are just a few minutes’ drive away. After a day of hiking or winter sports, enjoy the complimentary spa, located in the castle’s original watch tower, where a sauna, steam bath, infrared cabin, and relaxation room can be found. Sip on a glass of wine in the gazebo that looks out over the mountains, or warm yourself by the grand hearth fire, located in the original library and dining room. Boutique Hotel Schloss Matzen adds that extra enchantment to the already magical Alpine scenery! I (Kelly) visited Salzburg on one of my first trips to Europe and took the Sound of Music tour which included a trip to Schloss Leopoldskron. To this day, it’s one of the most breathtaking places I’ve ever been. 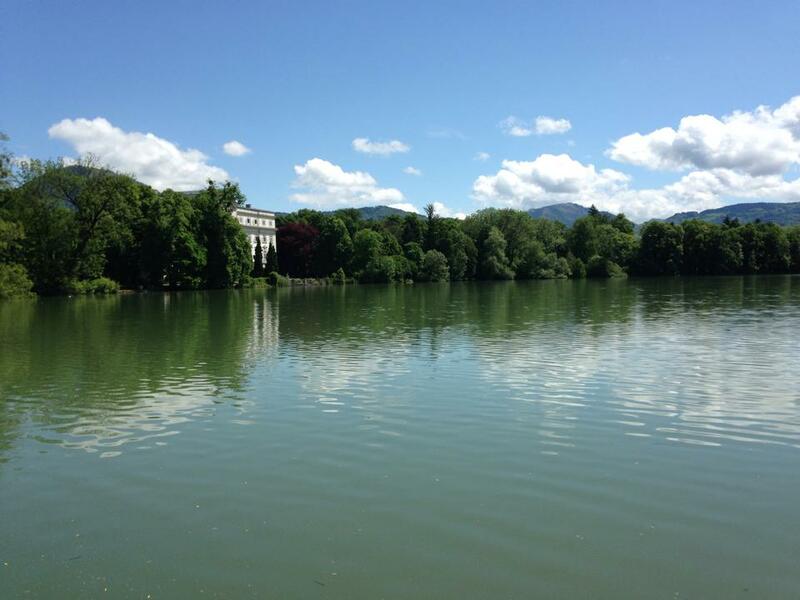 With it’s spot on the lake surrounded by Austrian hills, it’s no wonder it has a spot in The Sound of Music! We have never stayed at Hotel Schloss Leopoldskron, but love the idea of returning to this enchanting spot for a romantic weekend in Europe. 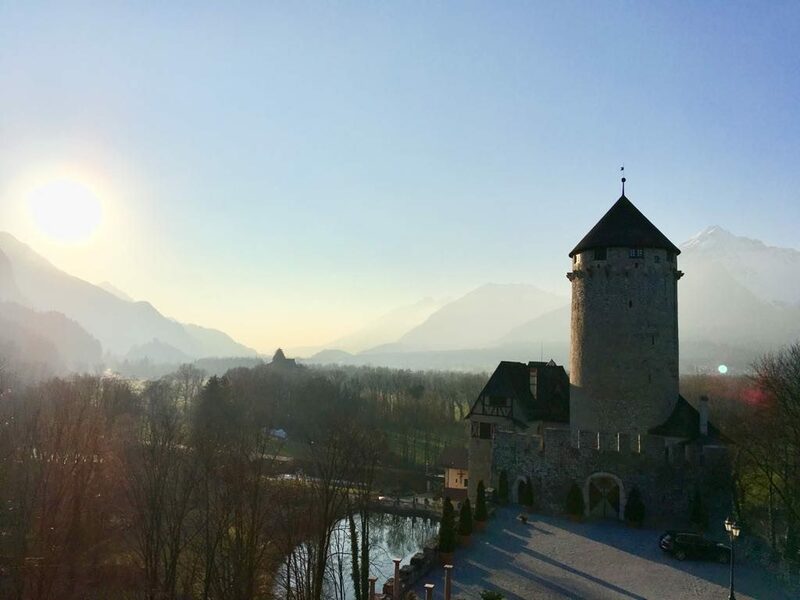 The hotel is located on 17-acres of beautiful land and only a 25 minute walk to Salzburg’s Old Town, meaning you get the best of both worlds: an intimate, remote setting and access to one of the most wonderful cities in Europe. The 12 “Schloss Suites” in the hotel look particularly delightful – with stunning views, a spacious room, and a bottle of Prosecco included, couples probably wouldn’t even want to leave the room if it weren’t for the appeal of a walk around the lake hand in hand. There’s no restaurant on site, so treat yourself to a taxi ride to one of Salzburg’s charming restaurants. 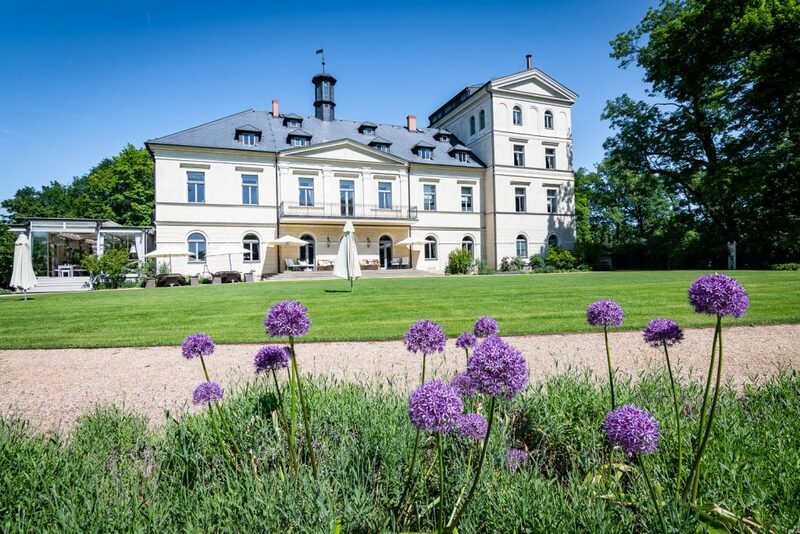 Chateau Mcely is located about 1 hour from Prague, and it’s the perfect place for a romantic weekend getaway. If you’re traveling to Czech Republic with your significant other and want to spoil yourself, this is the place to go. At Chateau Mcely, you will be staying in a luxury suite, which is decorated with extravagant details. While staying here you will definitely get the feeling of being a royal and taken care of. For couples, I would also recommend their couples massage treatment. They have their own spa-products at Chateau Mcely, and you can tell that they are very passionate about wellbeing and luxurious products. Most people who stay here also choose to eat dinner here since the Chateau itself is quite hidden away from cities within walking distance. However, with delicious food that is elegantly served, this is not a bad thing at all. The location is also perfect as you have a beautiful forest, and a pool area where you can relax. It’s also popular to have a drink at the terrace. We have loved all of the Soho House properties we’ve visited thus far, and would love to visit the one in Berlin during a romantic weekend away, as well. Not many people consider Berlin to be a romantic city, but it’s cool and quirky which is right up our alley when it comes to finding hidden romantic things to do. The Soho House properties has an air of exclusivity to them since the clubs are members only, which means they’re never too crowded. They’re also all beautifully designed, with plush reading corners, candle lit bars, and rooftop pools for a bit of rest and relaxation. There’s something so wonderful about being able to just hang out together during a romantic weekend away, and the Soho House properties tend to always offer a space for doing just that. The best part? Their “Big” rooms and larger ones have freestanding bathtubs; what’s more romantic than a glass of red in a bubble bath!? 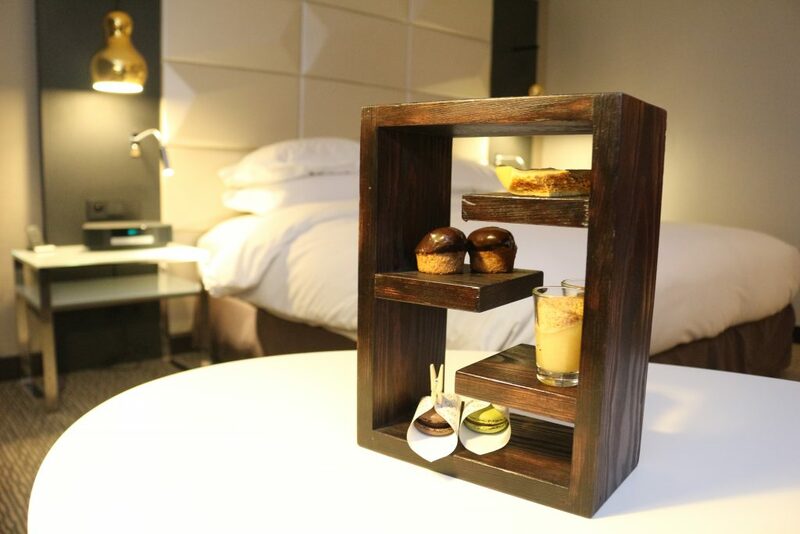 Located in the heart of the city of Warsaw, surrounded by both classical and modern architecture, the Sofitel Warsaw Victoria is one of the best hotels for a romantic getaway in Central Europe. Within its modern geometric exteriors is a 70s-inspired interior decor, where you shall be spending your evenings having intimate dinners prepared by world-renowned chefs at the La Brasserie Moderne, where you will be tempted with the lavish menu and mesmerized by the open kitchen’s show of cookery skills. Continue the romantic evening at the Victoria Lounge as you gaze into each other’s eyes and its sweeping views of Pilsudski Square or perhaps head to your room and have room service bring you’re a bottle of champagne for a more private setting. The next day, after feeding each other breakfast in the comforts of your own room, head to the hotel’s heated pool or perhaps soak up the romantic atmosphere as you walk through the city of Warsaw. The Slovak Tatra mountains might not be the first thing which comes to mind when looking for a romantic place to stay on Valentine’s Day. But it was Panoramic Mountain Residence in the High Tatra mountains which turned out to be the most romantic place we have ever been to. 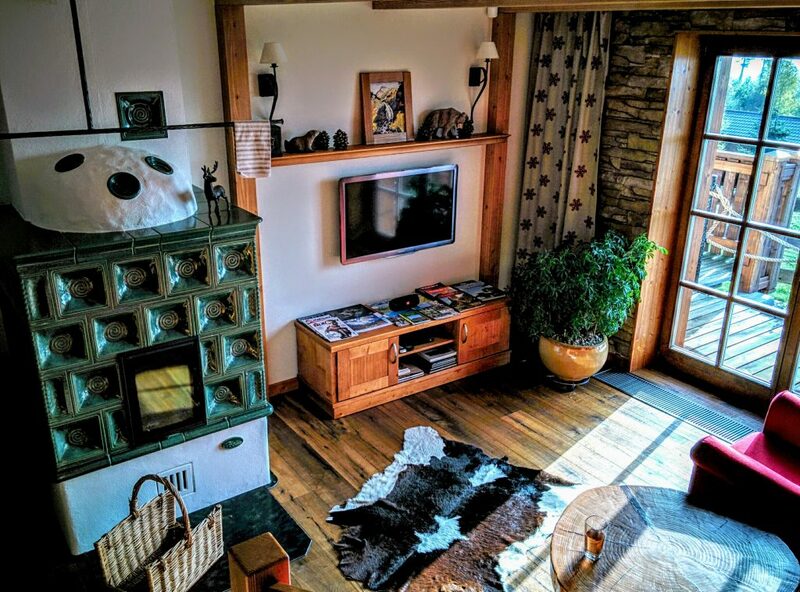 Located in picturesque village Vysoké Tatry-Horný Smokovec, right at the foot of the High Tatras, it is the best option for couples looking for romantic and luxurious getaway. 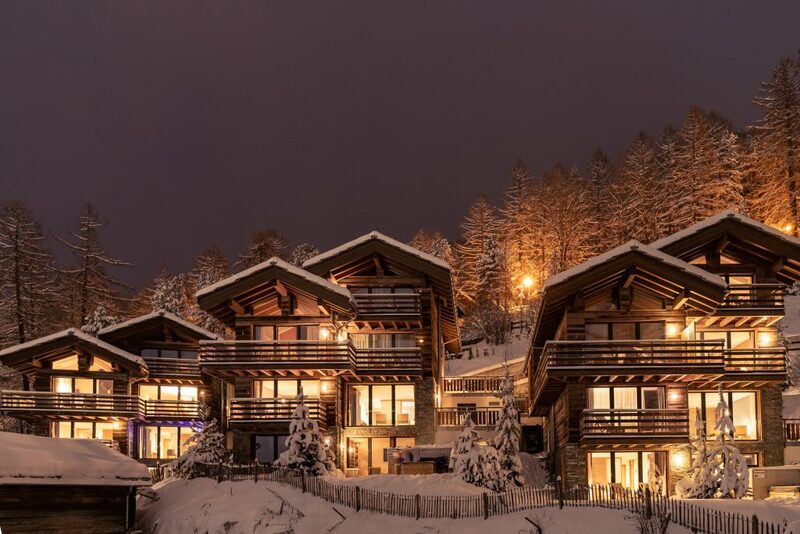 Panoramic Mountain Residence consists of several modern five-star mountain chalets. The interior is amazingly comfy and warm. Colors are nice and welcoming and the apartments are fully equipped. The buildings are made of wood and so are the interiors. An additional advantage is a tiled stove – it adds up warmth to the rooms and the fire gives perfect light for a romantic evening. The chalets have also access to outdoor pools with hot thermal water and a sauna – it is an ideal option after a whole day spent hiking in the mountains. Panoramic Mountain Residence is great place for nature lovers – it is conveniently situated close to hiking trails in High Tatra mountains. There is no better combo for Valentine’s Day than mountains and luxury! 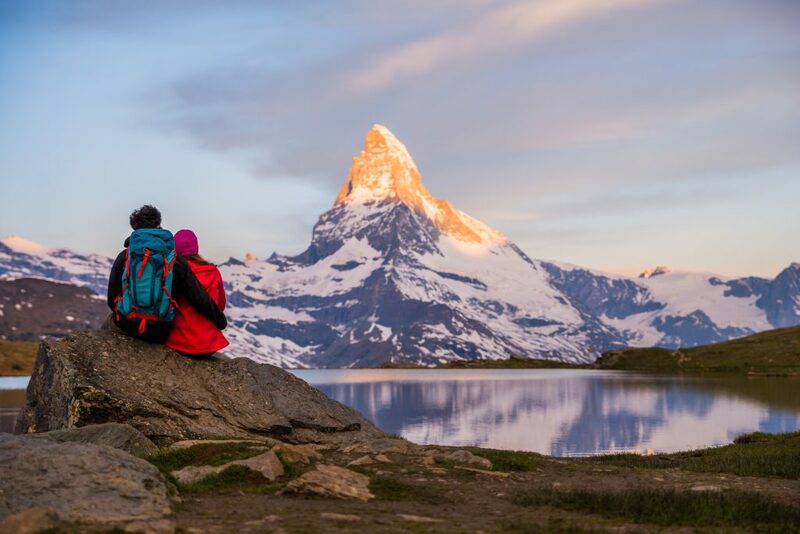 Zermatt is a skier’s paradise, but the feeling of luxury associated with the town makes it perfect for a romantic getaway, too. 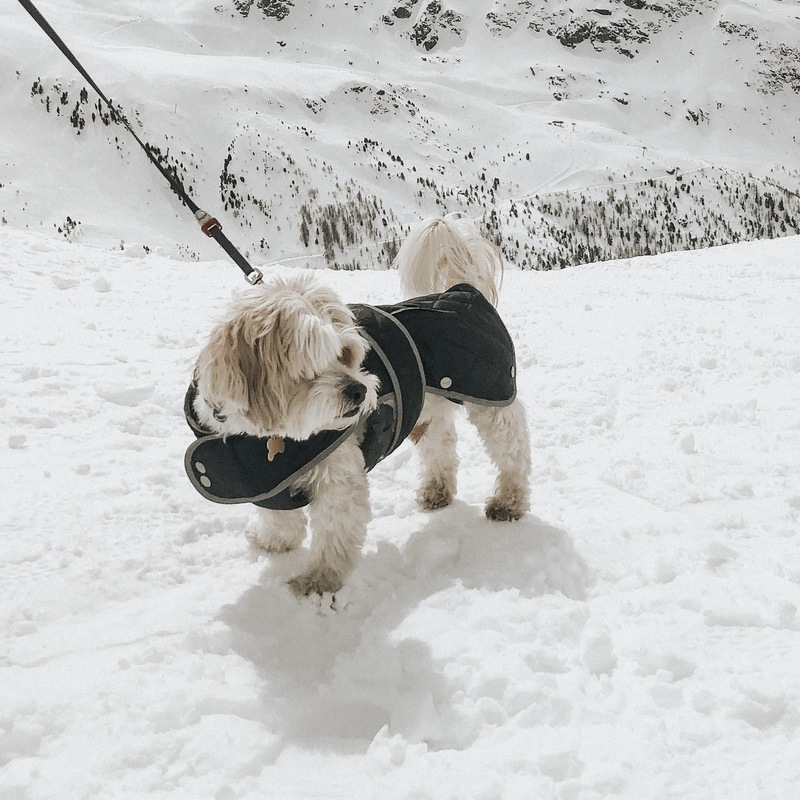 Whether you’re a couple that loves to spend a few days on the slopes, or you just want to relax in some mountain air, Zermatt is a great destination to visit with your sweetheart. Cervo Mountain Boutique Resort, located at the base of one of Zermatt’s most popular ski areas, is just the place to stay! Cervo perfectly embodies the term “modern luxury” with its furnishings and amenities – the rooms are cosy and decorated with items that remind us of hunting lodge (tartan wallpaper, yes please! ), perfect if you’re looking for the escape of a lodge weekend without missing out on the amenities of a luxury hotel. Rooms are split between six chalets and each chalet has its own spa, giving you the privacy you deserve for a romantic getaway. Cervo offers even more luxury beyond accommodation. 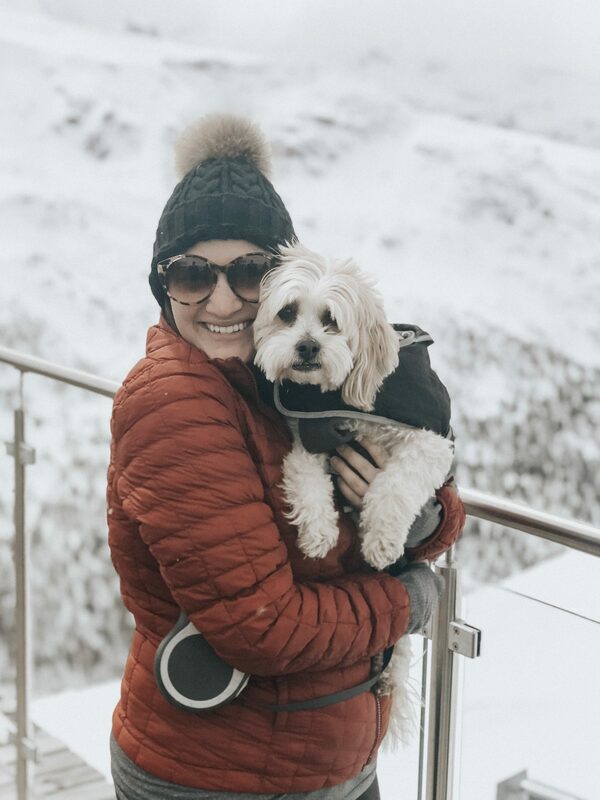 With multiple restaurants on site and one of the best aprés ski atmospheres in town, there’s no need to leave Cervo, unless you’re planning to hit the slopes, that is! 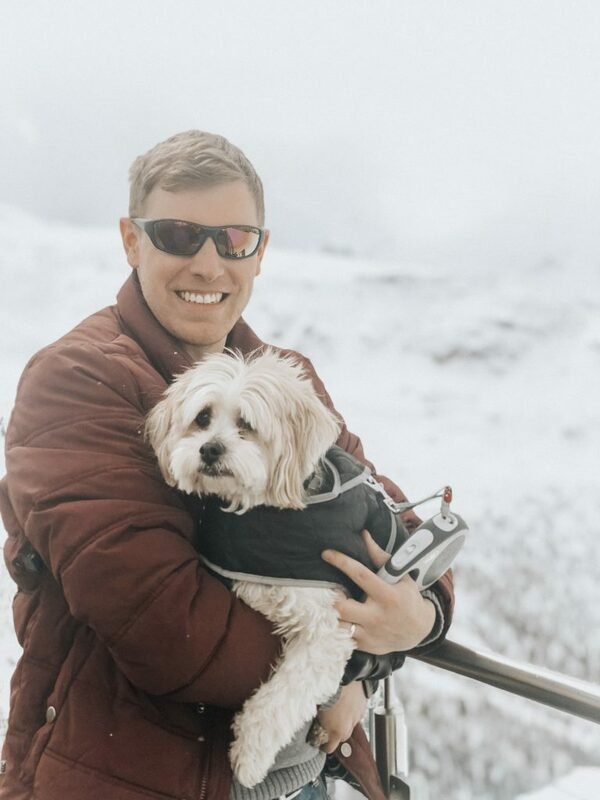 Enjoy a meal on the terrace overlooking the Matterhorn while cosying up under one of the provided blankets, or head to Ferdinand for cheese, cheese, and more cheese. If I had to name my favorite hotels in the world, Villa Orselina would be amongst them. Though I visited this luxury hotel by myself and not as a couple, I consider it as a perfect place for a romantic getaway. 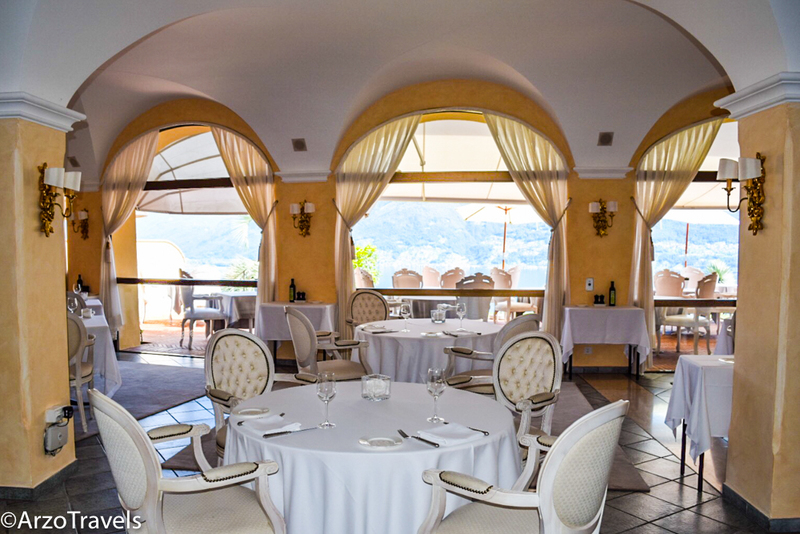 Villa Orselina, voted as the best small luxury hotel in Switzerland, is located in the canton of Ticino in Orselina, Switzerland – overlooking the stunning Lake Maggiore. This location alone makes the small boutique hotel pretty great – however, there is more than just the impressive views. The hotel does not impress with extravagance but with its minimalistic design and bright interior – and the views from the balcony are impressive. A romantic dinner in the hotel restaurant – I recommend sitting outdoors so you can overlook the lake and watch the sunset – is a must for some romantic time. I also suggest a nice spa treatment before ending the day on the balcony – all balconies face towards the lake and is a perfect place to end a romantic day. There are not many hotels in Switzerland that provide such a romantic atmosphere as Villa Orselina. The only downside is that the hotel is closed in the winter months and is only open from April to the end of October. Whether you are looking to go wine tasting in Germany, spend a day on Lake Geneva, or wander the streets of Prague during your romantic weekend away, there are so many romantic hotels in Central Europe that there’s bound to be a perfect one for you and your significant other! Which romantic hotel do you want to stay in?